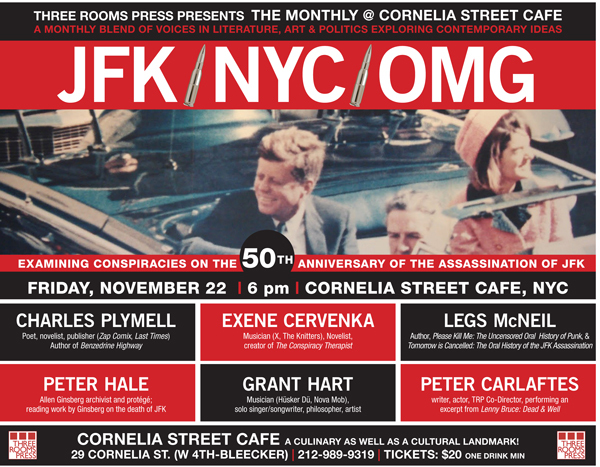 On the 50th Anniversary of the assassination of JFK, Three Rooms Press presents “JFK/NYC/OMG,” an examination of conspiracies on the 50th anniversary of the assassination of President Kennedy. Speakers include musician-philosopher Grant Hart, poet-novelist-publisher Charles Plymell, musician-writer-conspiracy therapist Exene Cervenka, Allen Ginsberg archivist Peter Hale, writer and Punk magazine co-founder Legs McNeil, and actor-writer Peter Carlaftes (channeling the spirit of Lenny Bruce). The event will take place Friday, November 22, 6 pm at Cornelia Street Cafe (29 Cornelia Street, between Bleecker and W. 4th), in the West Village. Tickets are $20, available at the door (arrive early to ensure admission). Additional information: info@threeroomspress.com. Grant Hart is best known for his work as drummer and songwriter in the seminal punk band Hüsker Dü, as well as an extended career as a solo singer/songwriter. Hart will speak about how the assassination shaped the lives of his generation. Charles Plymell is a poet, novelist and publisher, best known for his underground magazines, including Zap Comix and The Last Times, as well as his collaborations with beat authors Allen Ginsberg, William Burroughs, Herbert Huncke and Neal Cassady. Charles Plymell was with Cassady and Ginsberg at the time of the assassination. Exene Cervenka is lead vocalist for the the LA-based bands X and The Knitters. In addition to her musical career, she has written several books, and has recently developed a YouTube persona as Christine Notmyrealname – Conspiracy Therapist, and will unearth the facts behind the conspiracy. Legs McNeil is a writer and rock music historian. He is the co-founder and a writer for Punk magazine, and a former senior editor at Spin, as well as the author of Please Kill Me: The Uncensored Oral History of Punk, and the forthcoming Tomorrow Is Cancelled: The Oral History of the JFK Assassination. Peter Hale is an archivist and protégé of Allen Ginsberg and will read the Ginsberg poem Thanksgiving, which was written the week after the assassination on Thanksgiving 1963. Peter Carlaftes is a writer, actor and co-director of Three Rooms Press. The author of four books and eight plays, he recently developed a one-man show, Lenny Bruce: Dead and Well, in which he portrays a reincarnated Lenny Bruce, examining the madness of current world from his unique inspired perspective.